Peruvian hair is one of our most popular hair types, here is our Peruvian 3 bundles deals, it is cheaper for you to buy each bundle separately. 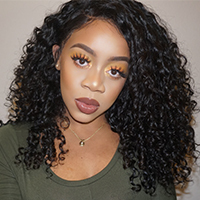 The hair is made with Peruvian human virgin hair, whose cuticles are complete and facing the same direction, the hair is soft and keeps its natural wave well. We never use chemical to treat our hair, the hair used for those bundles is directly cut from Peruvian single donors, 100% real human hair, the best you can find on hair market. Besides its natural attribute, each hair bundle from us is measured to be in true length, and weighs about 100g, we have natural black and light brown color options for this hair. Now buy these bundles can get extra 5% discount off.